Enjoy years of recreational basketball fun! Enjoy years of recreational basketball fun! 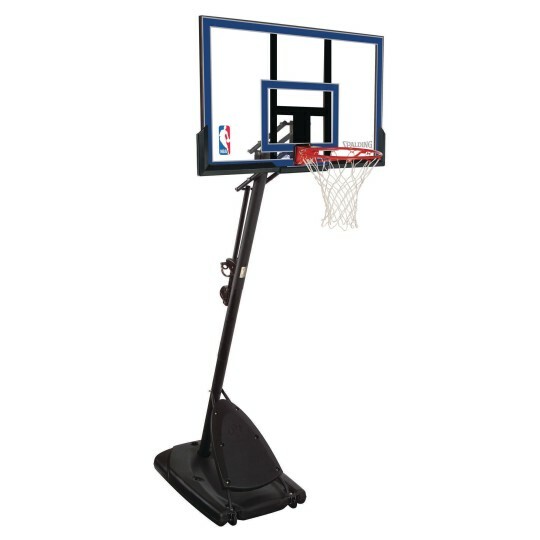 Spalding’s portable system features a 50” x 32” steel framed 1” x 1” clear acrylic backboard with square corners, an authentic styled board pad, heavy-duty solid steel Pro Slam® breakaway rim with steel rams to hold the net, ExactaHeight lift system with spring counter balance design that easily adjusts rim height from 7-1/2’ to 10’ in 6” increments, and a 3-piece, 3-1/2” diameter silver pole system. 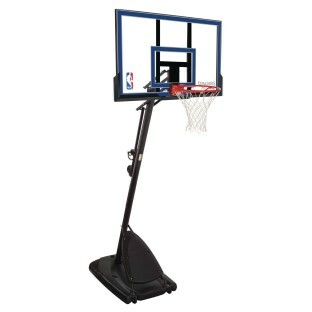 The front cover acts as a built-in rebounder and the 37-gallon base fills with sand or water for stability. This product was better built than I thought when ordered. It is very nice and great price.